I just found out that I made an error when counting the small screws for the mini tricopter. The pack contains 12 6mm screws when they should contain 14. I’ll be sending out two screws to all orders placed so far. I’m very sorry about the inconvenience. I believe that you had at least two kit orders coming from Alingsås, Sweden. Take 2 screws that limit arm movement and cut these to desired length. Put these where you miss 2 screws. Put zip-ties instead of these screws to limit arm movement. Extra benefit: it will help you to avoid breaking booms on sideways crashes. But give a bit more slack in the wiring then, to also avoid ripping pads off the PDB. Extra centimeter should be enough. If you have not yet sent the two screws for my Mini, I made another order (#12511) for a MiniTricopter Screw pack that is still processing. You could just throw the two extra screws in there so you can save the shipping costs. 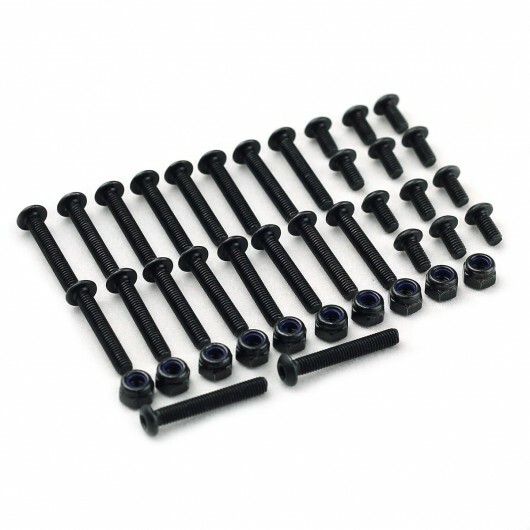 I ordered it because when I received my V3 Tri it was missing one 20mm screw so I bought a screw set for it just to have extras on hand and thought I would get an extra set for the mini just to have spares for it also because I haven’t been able to find any cap screws in the right size locally. Thanks for the great products you are offering. Just ordered the mini tricopter and a bunch of stuff from the store. Almost went for the V3 when it first came out but could not justify having 2 large platforms laying around. Now though, really excited to get into smaller scale and more agile flying. Some people may feel like you do, that they could’ve gotten some screws locally, or maybe even had some at home, but for others it might not be so easy to come by. As this was definitely something that should have been included, I don’t think it would be right to ask that those who wanted them would have to e-mail me or something, making them wait even longer, as this was my mistake. I just wanted to correct it as soon as possible so that everyone that had made an order could build their minis! Best customer service i have ever seen.